The Iranian American Women Foundation (IAWF)-the only non-profit organization providing networking and mentorship services to women of Iranian descent across all professional industries-launches its Los Angeles Chapter and also presents the 16th IAWF Women's Leadership Conference at the Westin Bonaventure Hotel (404 South Figueroa Street) in Los Angeles on Sunday, April 29, 2018, from 8:30 a.m. to 5:30 p.m. Azita Raji, the first female U.S. ambassador to Sweden, and the first Iranian-born American to serve as a U.S. ambassador, will keynote the event. IAWF is also actively seeking new applicants for its mentorship program, which supports women across the globe in achieving professional success. IAWF founder and recipient of the Ellis Island Medal of Honor, Mariam Khosravani says, "We are thrilled to now have a chapter in Los Angeles, and that our 16th IAWF Women's Leadership Conference comes at a key time with all that's changing in the world. I invite all women of Iranian descent to come have their voices heard, as well as network with some of the top women in business, philanthropy and academia." Amongst the thirty speakers at the conference are: Goli Ameri, former U.S. Assistant Secretary of State for Educational and Cultural Affairs; The Honorable Ashley Tabaddor, president, the National Association of Immigration Judges; Ferial Govashiri, the Chief of Staff to the Chief of Content at Netflix and former personal aide to President Barack Obama in the White House; Mahnaz Afkhami, president, Women's Learning Partnership (WLP) and former Minister for Women's Affairs in Iran. The IAWF Women's Leadership Conference offers a platform for exclusive access to leading professional women who will share stories of triumph and adversity, with the goal of empowering and inspiring the participants. Khosravani, along with IAWF trustees, board directors and new members, launched the new Los Angeles chapter at a private event at Porta Via in Beverly Hills on February 1, 2018. IAWF trustee and board member, Parisima Hassani, CEO of award-winning international architectural firm, Westgroup Designs, says, "IAWF connects Iranian women across all generations and professions globally. Our Mentorship Program is now calling for applicants from anywhere in the world. This initiative has been the platform for many women to achieve their dreams with resilience and fortitude by accessing instrumental resources and dedicated mentors." IAWF Women's Leadership Conference General Admission tickets are $175.00. Student tickets are $85.00. Tickets and more info can be found here. To learn about membership/sponsorship or how to get involved with the Iranian American Women Foundation, please email contact(at)iawfoundation(dot)org or visit the IAWF Website at www.iawfoundation.org. Founded in Orange County, California in 2012 by Mariam Khosravani, the Iranian American Women Foundation (IAWF) has held nationwide conferences in New York, Los Angeles, Washington D.C., San Francisco, San Diego, Irvine, as well as international conferences in London, UK and Toronto, Canada. These events showcase the achievements and contributions of women from Iranian descent across all industries and provide mentorship opportunities for the next generation of leaders. Each conference hosts up to 800 participants from all over the world. IAWF currently has over 2,500 members in its four chapters (Los Angeles, Orange County, New York, San Francisco) and an esteemed board of over thirty advisors, trustees and directors who are some of the nation's most prominent leaders and entrepreneurs. Azita Raji is an American diplomat, banker, and philanthropist. She was nominated by U.S. President Barack Obama in 2014 to serve as the United States ambassador to Sweden. 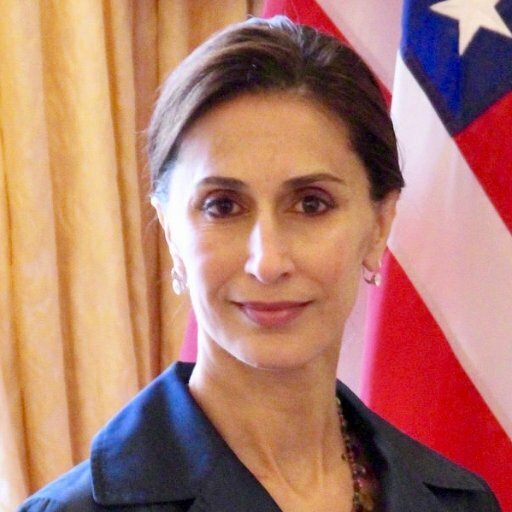 She was the first female U.S. ambassador to Sweden, and the first Iranian-born American to serve as a U.S. ambassador. In 2016, she was nominated for the U.S. State Department's highest award for a non-career ambassador, the Sue M. Cobb Prize for Exemplary Diplomatic Service. In recognition of her contributions to American society, Ambassador Raji has been recognized by The Carnegie Corporation of New York, and is a recipient of the Ellis Island Medal of Honor. These luminous leaders set long-term strategies for the Iranian American Women Foundation and act as the ambassadors for the organization: Fariba Ameri, Contemporary visual artist and philanthropist; Dr. Nina Ansary, award-winning author and UN Women appointed Global Champion for Innovation; Bita Daryabari, award-winning humanitarian and executive director of Pars Equality Center; Zohre Elahian, award-winning philanthropist and co-founder of Schools Online, managing director of Global Catalyst Foundation; Parisima Hassani, CEO of the award-winning international architectural firm Westgroup Designs; Shirin Hedayat, former financial advisor and master in intuitive medicine; Shahpar Khaledi, co-founder of Darioush Winery in Napa Valley and former director of Echelon; Nellie Keyhani, vice president of Advisory Services with Whittier Trust; Neda Nobari, former director and vice chair of bebe stores, Inc. and founder and president of the Neda Nobari Foundation; Violet Parvarandeh, philanthropist and former computer designer; Julie Ruehle, founder of Ruehle CFO Advisory and Ruehle Realty.